The story of how a 19th Century artist came to Wales by "mistake" to marry his partner when they were both dying from cancer is told in a new exhibition. 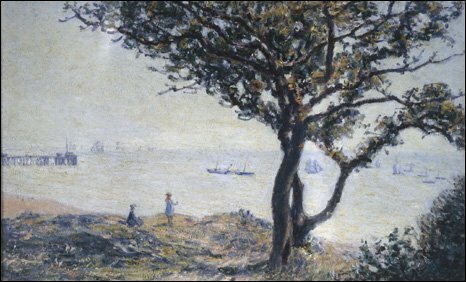 Paris-born Impressionist Alfred Sisley, a friend of Monet, painted some dramatic seascapes during his 1897 visit to Penarth and the Gower coast. The show, which combines these works with others from an earlier trip to London, is at the National Gallery. The exhibition moves to the National Museum Wales next March. 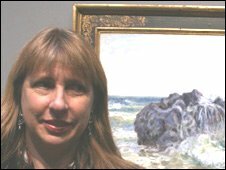 Professor Ann Sumner, who worked at the Welsh museum before becoming director of the Barber Institute in Birmingham, is joint curator of Sisley in England and Wales. She said Sisley and his long-term partner and mother of his two children, Eugenie Lescouezec, probably ended up in south Wales by mistake when they travelled to Britain. "They went originally to Falmouth, but something, we're not sure what exactly, was not right and after three days they set off for Cardiff." It seemed Sisley did not like Cardiff much either and the painter and his family moved on to the seaside resort of Penarth a few miles away, where they lodged for the first weeks of what was to be a very hot summer with the wife of a coal merchant. Prof Sumner said: "One of the main purposes of the couple's trip to Britain was to get married. Sisley had dual French and British nationality and so could marry in this country. "They were both dying of cancer and they did not want to cause any kind of problem. They just wanted to legitimise their two children." She said it may have been they chose south Wales because their daughter may have had a contact in the French consulate in Cardiff. Whatever the reason, the couple were married at Cardiff Town Hall on 5 August, 1897. Prof Sumner said Sisley fell in love with Penarth, with its fine esplanade, beach and pier. "He loved the idea of walking on the sea," she said. Among the works in this exhibition is The Cardiff Shipping Lane, painted from a cliff top vantage point in Penarth, looking back towards the pier. Prof Sumner said Sisley was inspired "by his great friend Monet and his views of the Normandy coast " in this striking work which also captures a paddle steamer , maybe the Waverley which still sails the route. From Penarth the artist and family moved to Langland Bay on the Gower coast where they stayed for their honeymoon at the now-disappeared Osborne Hotel for seven weeks before returning to France. 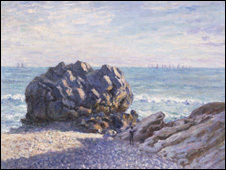 Sisley was fascinated by its dramatic carboniferous limestone cliff, and in particular a large rock which he could paint from his hotel balcony. He went on to paint "an extraordinary series" based around Storr's Rock, said Prof Sumner. "But if you go to Langland Bay today and ask for Storr's Rock, people will look blankly at you, because it is known as the Donkey rock. The artist captured striking at different times of the day and three of the are included in the latest exhibition, although its know not all the series have been traced. At the end of the summer, the Sisleys left Wales and returned to his studio in France with his artworks, which he had chosen not to try to sell while abroad. By this stage, he had become a full time carer to his wife who died within a year of their return. Sisley himself died three months later in January 1899. "It's a very sad story," said Prof Sumner. "But one that produced a fine series from a little painted area of the UK." The exhibition is at the National Gallery, London, until 15 February 2009 and from 7 March-14 June 2009 at National Museum Wales, in Cardiff.